I read a lot of food blogs. I mean, a lot. I occasionally save recipes to make but for the most part, I just enjoy looking at the pictures and reading the reviews. So it was really weird when I couldn’t get this macaroni and cheese out of my head after seeing it on Ezra Pound Cake. I seriously couldn’t stop thinking about it. 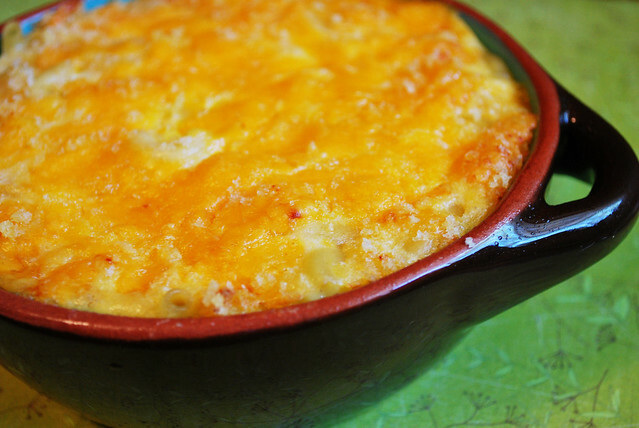 It seems like a basic macaroni recipe with the elbow noodles and sharp cheddar. But then you mix up eggs and cream and all kinds of goodness to pour over top. I topped mine with more cheddar and panko before putting it in the oven. It is absolutely the. best. thing. ever and this is coming from someone who doesn’t like macaroni and cheese that much. Since you cube the cheese instead of shredding it, you get super gooey cheese throughout it. And the grated onion? I’ll never make mac and cheese without it again! Cook the macaroni according to the package directions. Drain, and transfer to the baking dish. Mix in the cubed cheddar cheese. In a medium bowl, mix the flour, salt, dry mustard, pepper, cayenne pepper and nutmeg. Add the yogurt, followed by the egg, and whisk to blend. Stir in the onion, cream and Worcestershire sauce. 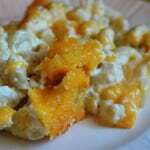 Pour this custard over the macaroni and cubed cheese, and stir to blend. Mix grated cheese and panko bread crumbs together. Sprinkle evenly over the surface of the custard. Bake until the custard is set around the edges of the dish but still a bit loose in the center, about 30 minutes. Remove from the oven, and cool for 10 minutes. 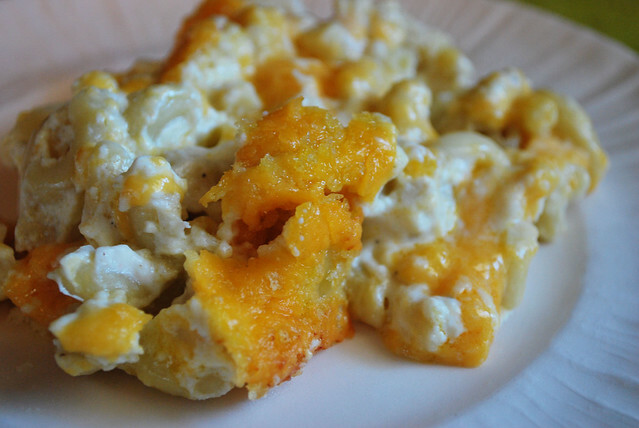 4 Responses to "Mac & Cheese"
OMG! I HAVE to make this ASAP! I am going to the grocery store tomorrow to get all the ingredients. I L-O-V-E Mac and Cheese. After my second back surgery, when my mom came and spent six weeks taking care of my husband, my boys, my dog, and little ol’ me…..there were two things I wanted to eat: broccoli bread and mac and cheese. That’s it. Maw-maw used Paula Deen’s recipe for mac and cheese, and it was awesome; however, I am never averse to trying new mac and cheese recipes!! I cut it down to make just a small portion for mine and Landon’s lunch so you might want to use the original: http://www.ezrapoundcake.com/archives/4468. It’s really good though! I’m gonna have to try Paula’s now.